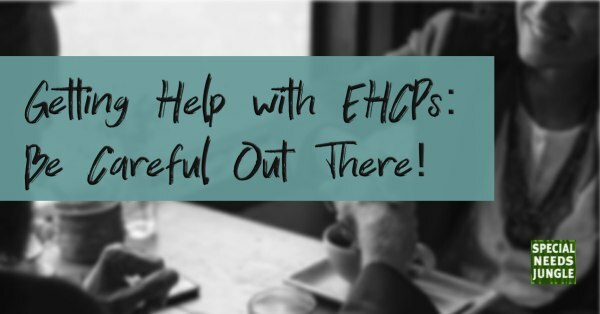 Getting Help with EHCPs: Many parents look for support when getting statutory support for their disabled children. Be Careful Out There! Just before Christmas, we took a look at some of the latest figures to come out of the Special Educational Needs & Disability Tribunal (SENDIST). Those figures shone light on a system that was starting to audibly creak under pressure. More and more appeals are being lodged, and an increasing number of those appeals go all the way to a hearing. For thousands of families each year, going to Tribunal represents their best shot at securing their children’s educational rights – and 89% of appeals went in favour of parents last year. But as the SENDIST system starts to run red-hot, other difficulties are emerging. Some families are finding it difficult to obtain honest and high-quality advocacy to support them with SENDIST appeals – and some are being badly and expensively let down. Over the last year, SNJ has come across an increasing number of cases where families have received poor, misleading, or inadequate advice from people supporting them with SENDIST appeals. SEND is a sector that’s long been blessed with high-quality advocates – not only qualified solicitors or barristers, but others too: veteran parents, specialist freelancers, and other volunteers who provide SENDIST appeal expertise at low cost or no cost. But demand from families for SENDIST appeal advice has spiralled. At its busiest point in the spring and early summer of last year, there were over 2,000 live SENDIST appeals in the system. In this situation, a small group of volunteer experts simply cannot help everyone. So others appear to be stepping in, with sometimes variable results. We’re hearing of more and more cases where families have been let down by people who claim to have the right expertise – but don’t. It’s tempting to conclude that this might just be amateur volunteers over-reaching themselves, but it’s not. Some unregulated advocates appear to be charging eye-watering amounts of money for very poor advice. And you’re not automatically fine if you can tap qualified legal support either. Some of the worst SENDIST advice we’ve seen over the last year has come from fully-qualified solicitors – often non-specialist commercial lawyers acting pro bono. There isn’t any need to panic. If you’re a parent considering an appeal to SENDIST, the chances are very high that the outcome will be in your favour. If you have the time, stomach and stamina for it, you might not need any extra support at all. And if you do need help with your appeal, you are still likely to be able to get reliable, high-quality support. But from what we’ve seen in the last year, we’d advise parents to be thoughtful when reaching out for help with SENDIST appeals. First up, think about whether you can manage this appeal by yourself. There’s no shame in asking for help, but it’s worth asking yourself this question first. The chances are very high that you will be contesting LA decisions that a SENDIST panel will find to be wrong. It is possible to win SENDIST appeals without help – but there’s little doubt that the process is grinding. And in some cases, the situation may be so specialised that you are very likely to need expert help. Do some research: how long has the advocate been working in the field of SEND? Has the advocate published anything online, via a website, blog, or via social media? Ask for references, and if the advocate isn’t a lawyer, then look at the advocate’s professional background. Word of mouth can be helpful, but don’t rely on a single source if you can help it. Experience & Expertise: What depth of SEND law experience does the advocate or lawyer have, and how does this experience relate to your own appeal? The substance of an individual Tribunal appeal varies from case to case, and if the advocate doesn’t have the required experience for your particular case, it could make matters worse. This isn’t just a potential issue with bringing in an inexperienced, have-a-go-hero parent from a Facebook group with one Tribunal under their belt. Even if you’re getting support from a fully-qualified lawyer, you need to find out if they genuinely know their education and SEND law – and whether they’ve got specific experience in what’s being disputed in your SENDIST appeal. Even pro bono Magic Circle lawyers can trip themselves up if they don’t know the field well. What am I paying for, and what will I be getting? Before you pay anything, make sure you understand any financial arrangements between you and the advocate for your case – not only for any initial help, but also any ongoing support. If it’s an advocate working for a big organisation, clarify who’ll actually be doing the work. Ask the advocate whether they have legal liability insurance, or how they resolve problems if they emerge. Solicitors and barristers are regulated and have professional codes of ethics, but not every advocate is regulated. Ask around – If you’ve decided to pay for SENDIST support, get quotes from several suppliers. Advocates are usually cheaper than qualified solicitors or barristers, but not always. Can I work with this person? If you choose to pay an advocate or lawyer for SENDIST support, you’ll be in regular contact with this person for weeks and months. It matters whether you can get on with this person. Think more broadly too about how they communicate. It might be tempting to sign up with someone who clearly enjoys a legal brawl, but that won’t necessarily get you the outcome you need – particularly when you’re the one who’ll be dealing with your LA in the long-term. And over the last year, we’ve heard of more and more cases where families have been let down by people who claim to have the right expertise, but don’t. It’s tempting to conclude that this might just be amateur volunteers over-reaching themselves, but it’s not. Some unregulated advocates appear to be charging eye-watering amounts of money for very poor advice. And you’re not automatically fine if you can tap qualified legal support either – some of the worst SENDIST advice we’ve seen over the last year has come from fully-qualified non-specialist solicitors.